Our new Customised Full Colour Pens with Branding are absolutely brilliant when it comes down to customisability. Our choice extends not from just opaque or frosted pen construction, but the colour array available for each part - clip, grip, plug and section with a 20 colour choice!! 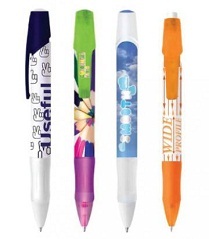 Company logo branding on this pen ensures good visibility and retention for your brand-name. Customers will notice your generousity and will make use of a good quality documental ink filled pen,with blue or black ink available at your choice. Brilliant on a customer's desk, you can't beat the price to quality ratio!! For a FREE QUOTE, please fill in the form regarding our Customised Full Colour Pens with Branding and we'll be able to help you.